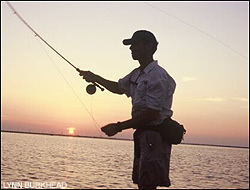 The saltwater flats near Aransas Pass and Port Aranasas are a mecca for flyanglers hoping to hook redfish or speckled trout. It is a day that will live forever in infamy for Americans: the date of Dec. 7. But for Bill Harvey, a biologist with the Texas Parks and Wildlife Department’s Aquatic Resource Protection Division, the day brings something more than solemn reflection on the attack on U.S. forces at Pearl Harbor in 1941. It also brings back memories of the best flyfishing day of his saltwater angling life. On Dec. 7, 2000 Harvey was wading the saltwater flats near Aransas Pass, Texas when he encountered a swath of nervous water that he first thought must be baitfish. Closer inspection found a mass of redfish actively feeding in the shallow water. A quick cast soon found Harvey hooked up with a battling redfish. Hours later, the exhausted angler finally decided that enough was enough. That’s an easy conclusion to reach after hooking and landing 63 redfish on a fly rod. “I found them about 9 o’clock that morning and I finally quit about five o’clock that day because I just wasn’t mad at them anymore,” Harvey laughed. Lest you think that Harvey’s experience was a December aberration, think again. Just days ago, the TPWD biologist and several flyfishing friends teamed to catch 70 redfish on their fly rods while fishing the same region northeast of Corpus Christi. The biologist cautions that not every day in December is like that however. But when the conditions are just right, big groups of redfish prepping to go offshore into the Gulf of Mexico can provide memorable days of flyfishing. The first key according to Harvey is tranquil and moderating weather. While wintertime cold fronts can plunge into the heart of coastal South Texas, such fronts are rare and seldom long lived. As the post front winds die down and the air mass begins to moderate, Harvey is on the lookout for tidal movement. 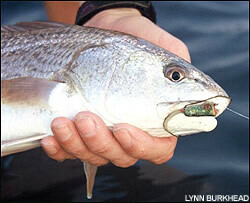 One of the most exciting ways to catch redfish is on small poppers. This chunky red fell for a popper near Port Aransas, Texas. On a rising tide, he’ll look for the areas of shallowest water where fish are easily spotted and stalked. On a falling tide, Harvey looks for funnels that act like a bathtub drainpipe. “If you’ve got water coming off of a flat, the fish are going to hang out at the intersection of the deeper water and shallower water because the draining tide will bring food down to them,” Harvey said. Such funnels also serve another function since water on shallow flats warms quicker than the surrounding deeper water. As this warmer water evacuates off the flats, the redfish seek out these columns of warmer, more comfortable liquid. Harvey said that finding such heat plumes is relatively simple — just look for the cuts and channels that evacuating water has to travel through on its journey back out to sea. Once such a spot is found, concentrate on working the edges. “All fish species like, at least the predatory species, to be in places where there is differential current,” Harvey said. Such spots are most often found where two different areas of water converge. During the winter months, the TPWD biologist uses six to eight weight rods depending on the wind. While Harvey concedes that a six weight line is less likely to spook a redfish at any time of the year, he uses the lighter tackle only during the winter when cooler water temperatures keep stress on hooked fish to a minimum. The diet of redfish includes plenty of small crabs like the one being held by Bill Harvey. In addition to crab patterns, other flies imitating small saltwater baitfish and shrimp work well on Texas reds. 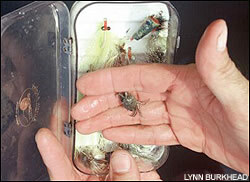 Typical flies in a Texas saltwater fly box include Clouser minnows, crab imitations, shrimp patterns, Seaducers, spoon flies, and even poppers for warmer days. Top colors include chartreuse, orange, brown, gold, white, and pink. Sizes of flies range from four to eight with varying amounts of weight that enable anglers to fish the entire water column. The bottom line for Harvey is that the month of Christmas offers a superb time to fly fish for Texas redfish. At least if Old Man Winter cooperates a bit.